The flow of emails containing malicious content continues to increase. When an email can propagate worldwide in minutes it’s just not possible for any antimalware software to be completely up to date. So, your best defence against infection is your user. If you feel compelled to click a link or open an attachment think about it. If you’re not expecting an email, confirm with the apparent sender before taking any action recommended in it. Look carefully at the email. Any sign of being cobbled together and/or grammatical mistakes it’s probably false. Subscribe to this blog to ensure you receive tips and advice such as this. Dropbox hacked – change your password. Do you use Dropbox? If so, we recommend you change your password now. Also, if you’ve used the same passwords anywhere else, change that too. Strange that there’s no mention of it on the Dropbox home page but maybe they’re embarrassed. And……..why not turn on two factor authentication as well? Some telephony advice. 118 call charges, Mobile nuisance calls and 070 scam calls. Ofcom and BT are introducing 20 new service charge bands in July 2016, SC081 to SC100, for 08/09/118 calls. The new charges mostly fill in gaps in the previous 80 bands, but include some horrible 118 bands, ranging from £8.98 to £15.98 for the first minute, then £4.49 to £7.99 per extra minute. So 118 calls to that last band will cost £96 for 10 minutes, or £16 for a misdialled number. Just because the new charge bands exist does not mean operators will necessarily use them, but most will have been created to meet specific requirements of operators like 118118, who last raised its cost in March to £6.98+£3.49/min (£34 for 10 minutes). 08/09/118 numbers are called Service Numbers. Calls costs to these numbers are comprised of 2 components the access charge set by your telco and the service charge set by the company you are calling. The service charge should be stated on all adverts. The service charges are not well publicised but they are laid out here. The bands are designated SC01 to SC100 but the latest lists that we have found only go to SC80. Access charges from BT are around 10p per minute additionally and mobile companies charge around 45p per minute. So for example calls to 118118 cost Calls to 118 118 cost £3.49 per call plus £3.49 per minute, (minimum 60 second charge applies) plus the Access charge. Both of the following are from the Ofcom for Consumers website here. If we need our RMM (Remote Monitoring and Management) tool installing on your PC we’ll provide you with the installation file possibly with a download link. On newer machines you may get a warning where it appears you’re unable to run the file. However, you need to click on the “More info” link and then you’ll get taken to the next dialogue allowing you to run. Normally, this is to protect you from inadvertently running an unsigned, which usually means suspicious, file or program. In this case, our agent is specific to each of our customers so it’s not feasible to sign each one and so you’ll have to tolerate this. As you’re fully aware of what you’re doing then it’s not a problem in this situation. Obviously, if you see this when downloading something else you should check with us before proceeding. Addons are an important part of any modern browser. Using addons, it is possible to extend and modify features of the browser. In Internet Explorer, addons are implemented as special applications that start with IE and provide toolbars, buttons and handlers for various multimedia content. Some common add-ons are Adobe Flash, QuickTime, and Silverlight. Another example is the Classic IE addon, which is part of Classic Shell, which restores the caption to the title bar, and page loading progress indicator bar and security zone to IE’s status bar. If you have many addons installed, it can affect the browser’s performance and also cause stability issues. If your IE is crashing or slowing down, it is useful to run the browser in the addons-free mode to troubleshoot and fix problems with addons. 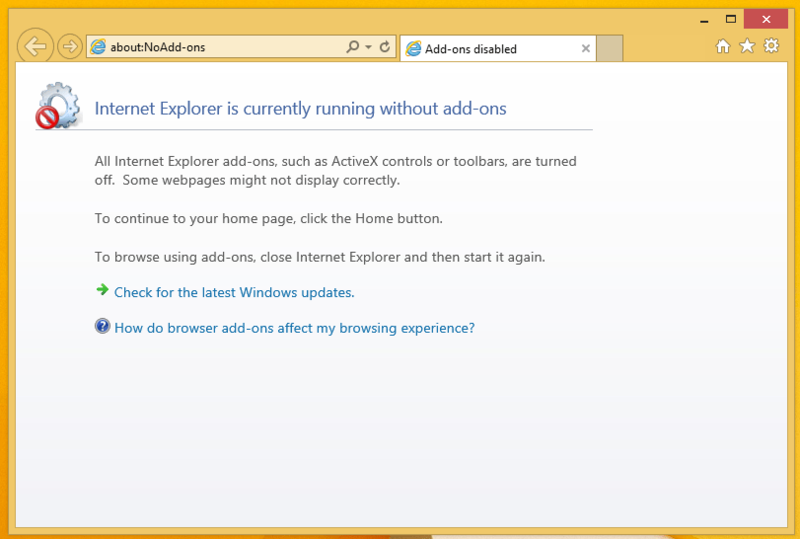 Internet Explorer has a special command line argument, -extoff, which tells the browser to start in No Add-ons mode. In this mode, all addons are disabled and the browser will notify you about this. Note the hyphen before ‘extoff’. You can type this command directly in the Run dialog (press Win + R shortcut keys on the keyboard and press Enter after entering the above command). 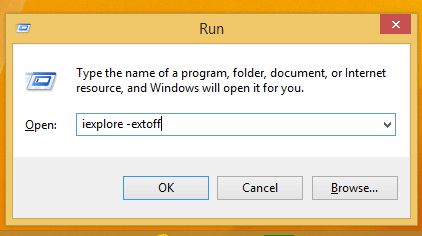 It will work even if you don’t type the full path to IExplore.exe because Windows comes with a special run alias for Internet Explorer.